You’re never far from the coast when you’re on Amelia Island. While there is certainly plenty to do on land, exploring the coast from the water opens up a whole new world–cue the Aladdin song. As it turns out, kayaking is the best way to explore the ecosystems of Amelia Island. It’s low impact, relaxing and lets you enjoy the serenity of the natural habitats located near the water’s edge. Each area and tour is completely unique and fascinating. Feel like paddling in the open waters off of Fort Clinch? The Cumberland Island trip paddles across to Cumberland Island, where wild horses roam free. Looking for a wooded excursion? The Suwannee River trip is a full day trip that sends you and your group paddling through the twists and bends of the river lined with Cypress and limestone. While all skill levels are encouraged for all trips, this trip does involve a brief portaging at Big Shoals. Amber, one of the guides at Amelia Island Kayak excursions, is confident that everyone can enjoy kayaking. And since there are plenty of kayaking services in the area, Amber offered her insight on why Amelia Island Kayak Excursions is at the top. Let Amber and the team at Amelia Island Kayak Excursions show you the wildly beautiful side of Amelia Island. 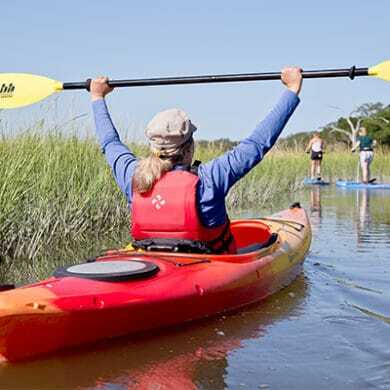 Since the different excursions have different starting points all over the island, Amelia Island Kayak Excursions will let you know in advance where to meet. For more information, visit the Amelia Island Kayak Excursions website. To make a reservation, call (904) 557-5307.